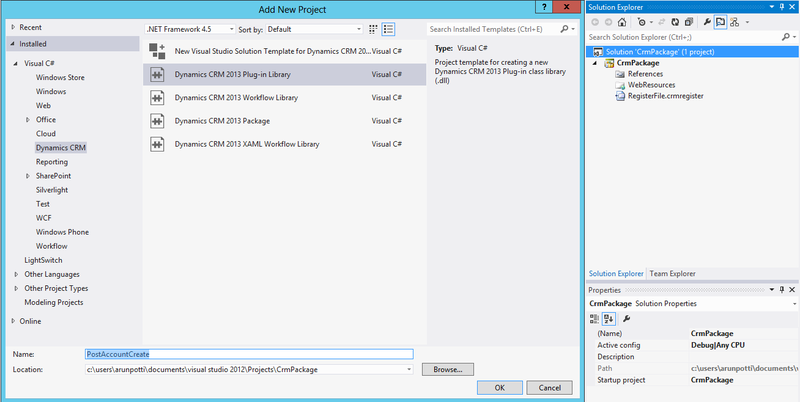 Will see a simple example, to develop and deploy plugin in CRM Online 2013 using SDK Developer Tool Kit in Visual Studio 2012. Task: On Post Create of Account, Task should create. If you do not have Developer Tool Kit on your Visual Studio, Click Here to know about Installation process. Step 1: Open Visual Studio 2012. Click on New Project. 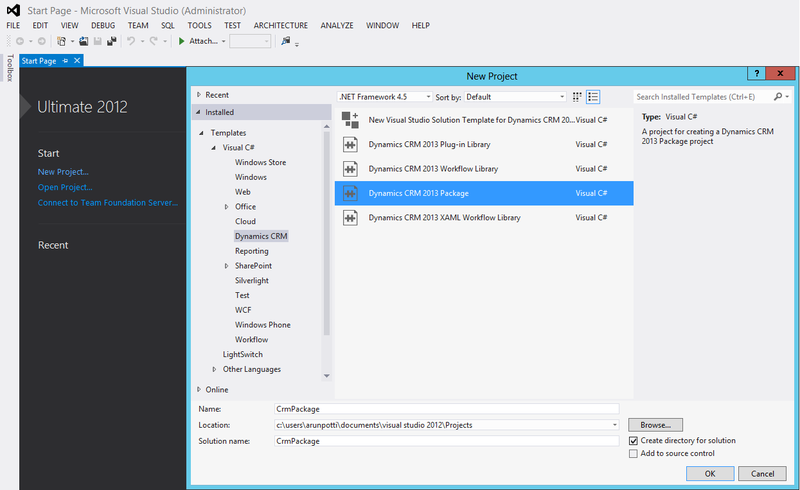 Goto Visual C# -> Dynamics CRM -> Dynamics CRM 2013 Package. Provide Name “CrmPackage”. 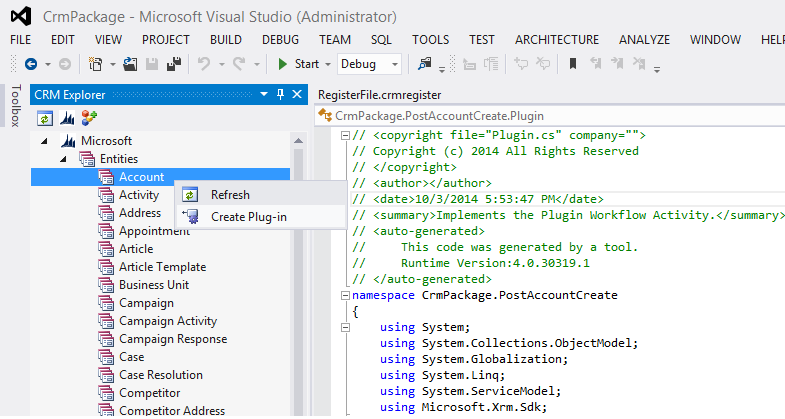 This package is helpful for Deploying Plugin from Visual Studio. 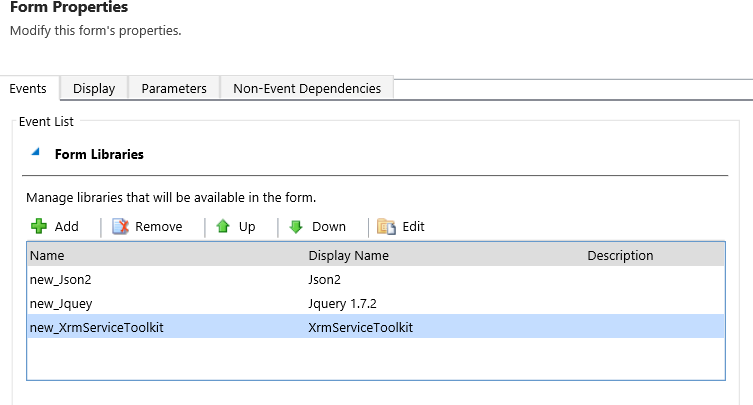 Microsoft Dynamics CRM -> Settings -> Customizations -> Developer Resources -> Discovery Service. Select Protocol to HTTPS and click on Connect. Provide User name & Password and click on Log on. 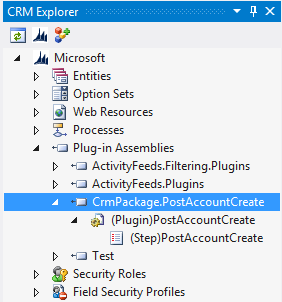 Step 3: Right Click on Solution ‘CrmPackage’ (1 project) and Select Dynamics CRM 2013 Plug-in Library. Provide Name as “PostAccountCreate” and click ok. Step 4: On the Left Hand Side, we can see CRM Explorer. 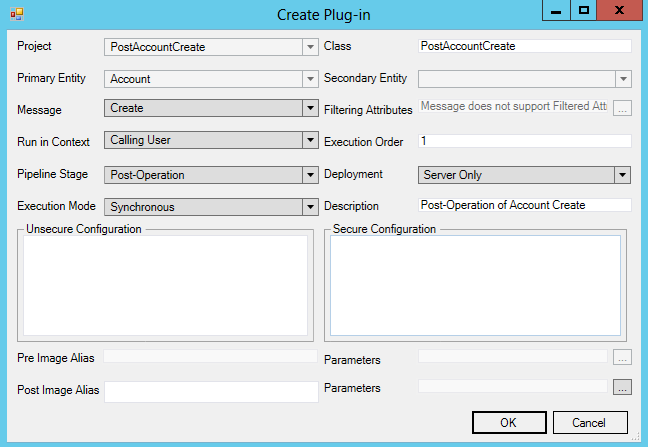 Goto Microsoft -> Entities -> Account -> Create Plug-in. Step 5: Select Message, Run in Context, Pipeline Stage and Execution Mode as mentioned below. Click OK. Step 7: Have to provide Strong Key to the Plugin. For that Go to Solution Explorer on the right hand side, Right Click On “PostAccountCreate” and click on Properties . Step 8: Follow the below steps for Strong Key set up. Go to Signing and Select Sign the assembly. 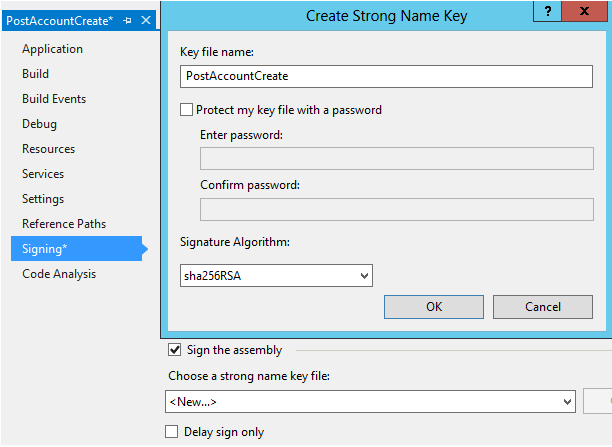 Choose a strong name key file: to <New…>. Provide Key file name: as “PostAccountCreate” and uncheck the Protect my key file with a password. Step 10: Copy and paste the below code in method ExecutePostAccountCreate after //TODO: Implement your custom Plug-in business logic. Step 12: Save All. Click on F6 to build the solution. 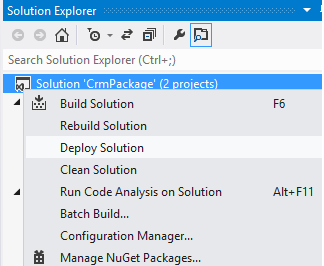 Step 13: Goto Solution Explorer, and right Click on Solution ‘CrmPackage’ (2 projects). 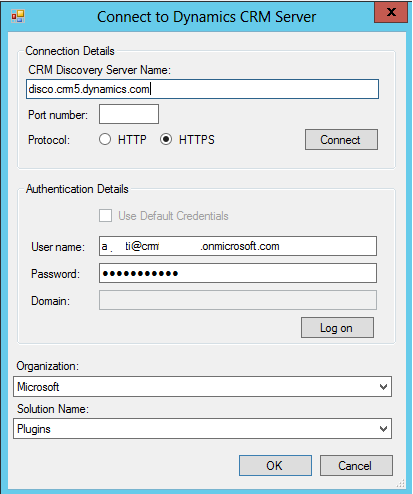 Click on Deploy Solution to deploy into Online CRM 2013. A plug-in is custom business logic (code) that you can integrate with Microsoft Dynamics CRM Online or OnPremise to modify or augment the standard behavior of the platform. The Microsoft Dynamics CRM event processing subsystem executes plug-ins based on a message pipeline execution model. 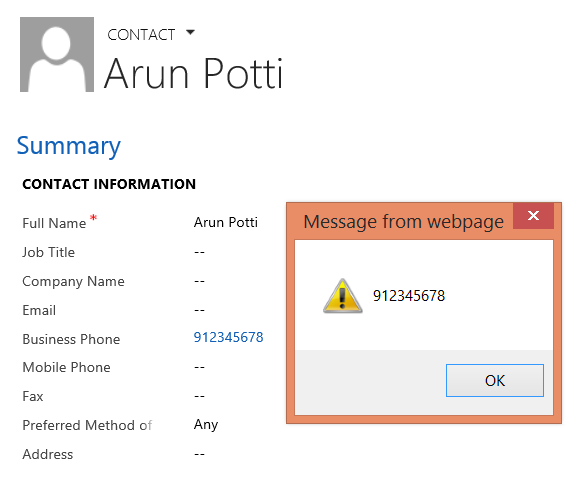 A user action in the Microsoft Dynamics CRM Web application or an SDK method call by a plug-in or other application results in a message being sent to the organization Web service. The message contains business entity information and core operation information. The message is passed through the event execution pipeline where it can be read or modified by the platform core operation and any registered plug-ins. Note: While there are several Web services hosted by the Microsoft Dynamics CRM platform, only events triggered by the organization and OData endpoints can cause plug-ins to execute. The following figure illustrates the overall architecture of the Microsoft Dynamics CRM platform with respect to both synchronous and asynchronous event processing. 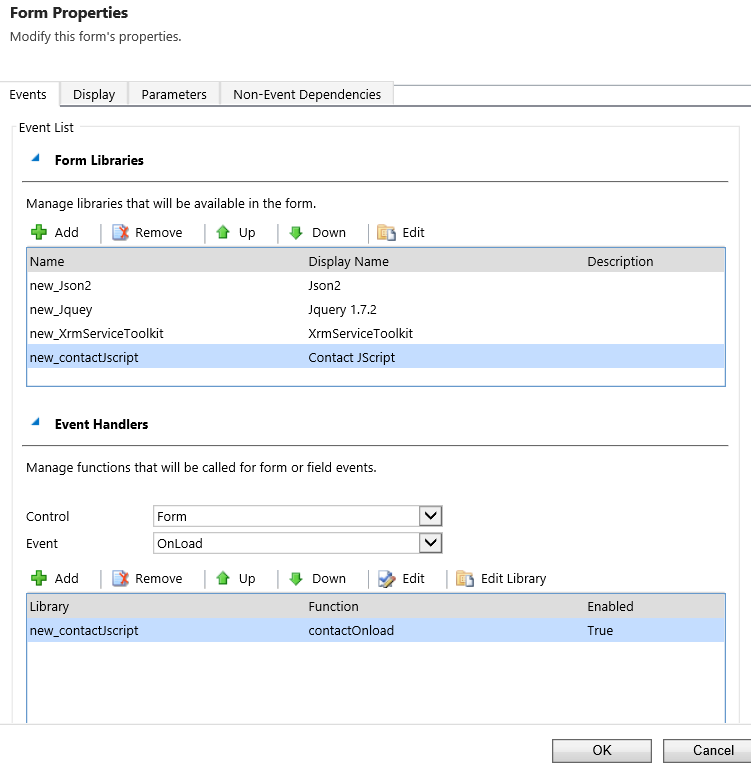 The event execution pipeline processes events either synchronously or asynchronously. The platform core operation and any plug-ins registered for synchronous execution are executed immediately. Synchronous plug-ins that are registered for the event are executed in a well-defined order. Plug-ins registered for asynchronous execution are queued by the Asynchronous Queue Agent and executed at a later time by the asynchronous service. Regardless of whether a plug-in executes synchronously or asynchronously, there is a 2 minute time limit imposed on the execution of a (message) request. If the execution of your plug-in logic exceeds the time limit, a System.TimeoutException is thrown. If a plug-in needs more processing time than the 2 minute time limit, consider using a workflow or other background process to accomplish the intended task. Event Pipeline Stages are 4, in which we can register plugin in 3 Stages. Pre Image: A pre-image is a snapshot of the entity’s attributes before the core operation. Post Image: A post-image is a snapshot of the entity’s attribute after the core operation.